Today Hydrolyzed “soluble” Zeolite technology has revolutionized the industry. What is the difference between powders and powdered suspension? The amount of zeolite you get with each dose and the amount of money you pay for the product primarily. A powder is a powder whether it is in water or not. Both delivery methods offer a mineral that is insoluble and unable to be absorbed in the body so they both provide benefits in the gut and gastrointestinal (GI) tract. Since both products work in the same part of the body and do the same thing it would make sense to use the product with the lowest cost and the greatest amount of volume. 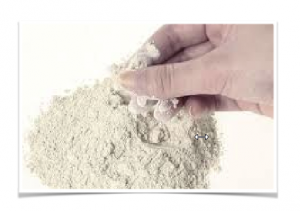 This makes the zeolite powders the best option if you are looking to detoxify your GI tract. Detoxification of your GI tract and gut is only the tip of the iceberg for total wellness, however, in order to get well and function optimally you have to detoxify your entire body. Heavy metals like mercury and aluminum are neurotoxins and lipophilic, meaning they prefer to be stored in fats and in the brain and central nervous system. Other chemicals and toxins end up everywhere in the body. Whether it is lead and strontium 90 in your bones, cesium 137 in our heart, or organophosphates (think glyphosate) terrorizing your liver, the list is long and distinguished. The Romans proved the power of zeolites and their benefits environmentally and it has taken centuries of scientific advancement to be able to take these benefits internally with Hydrolyzed “soluble” Zeolite solutions that are capable of crossing cell membranes. This includes the GI tract, adipose and tissue cells as well as the blood brain barrier, central nervous system and mitochondrial walls allowing these amazing particles to get into the most important parts of the body where these killer toxins are sequestered to have them bound and passively removed. The process of hydrolysis is proven scientifically with pharmaceutical level testing such as Liquid Chromatography Mass Spectroscopy analysis and independent research by leading physicians in the field of heavy metal detoxification. The ability to detoxify the body has changed and become very simple. A few drops two to three times daily and you are on your way. If systemic detoxification is your desire and you understand the power of zeolites and their ability to bind and remove heavy metals, environmental toxins and other chemicals your best option is to find the best Hydrolyzed “soluble” Zeolite technology on the market.